Are You Cooking? 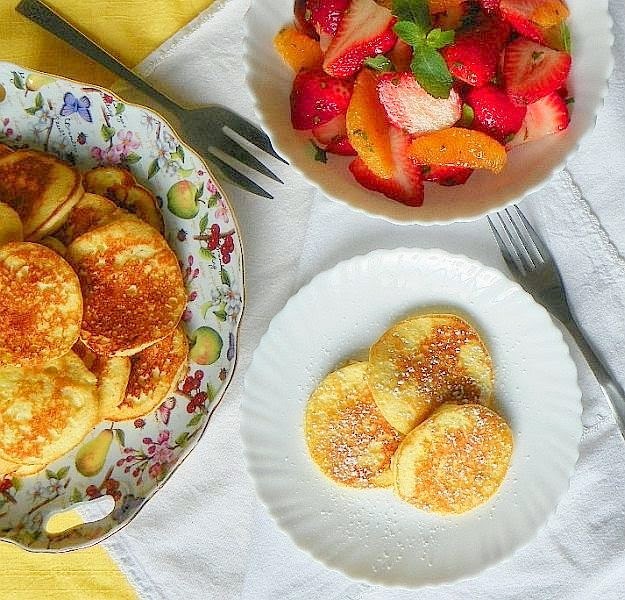 : Orange and Ricotta Pancakes - IHCC Let's Do Brunch! 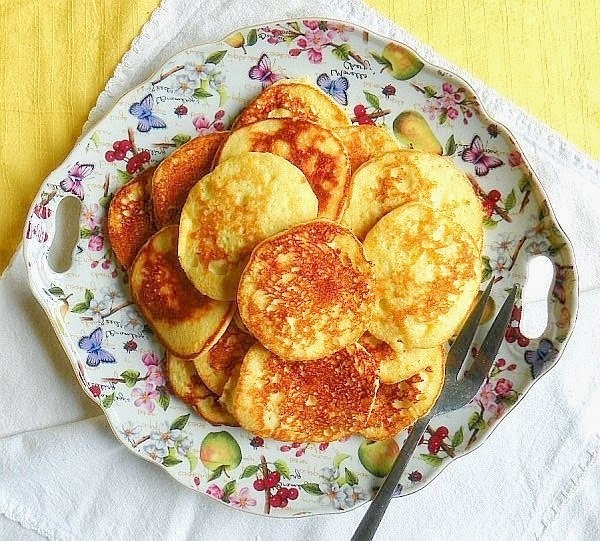 Orange and Ricotta Pancakes - IHCC Let's Do Brunch! I love to make special pancakes when I have extra time in the morning and since brunch is this week's I Heart Cooking Club theme, I took the opportunity to try Nigel Slater's Orange and Ricotta Pancakes from his book The Kitchen Diaries. The batter ingredients were simple, made up primarily of ricotta cheese and eggs with just a little bit of flour, sugar (I used half), and orange zest, of course. I determined after a few tries (and some burned pancakes with raw centres) that medium-low heat worked best, producing golden pancakes, fluffy and soufflé-like. Because they were quite fragile, smaller was better also, with only 2 tbsp of batter per pancake producing approximately 20, enough to serve 4-6. Sweet, delicate and redolent of orange, they were very special indeed and perfect for a lovely spring brunch. Variations of the recipe with added fruit can be found online here and here. Visit here to find out what other Nigel Slater dishes made it to brunch at IHCC! I grew up (in a Polish home albeit in Canada) eating pancakes for supper....I think it's a European thing ;)! Mmm... These are such happy, sunshiny little pancakes and the perfect breakfast with that gorgeous fresh fruit salad. Lovely pancakes! I almost made these pancakes! They look perfect for breakfast or a light lunch treat, with your lovely plate of fresh strawberries and oranges! Yums! I have heard that pancakes made with ricotta are especially light and fluffy. I definitely want to give these a try. The pancakes look lovely served next to that gorgeous fruit salad. I love to make special pancakes too, especially for a leisurely weekend brunch - these look utterly delicious. Nothing like a good pancake for brunch. I love the small shape.